The Full Moon presents a time for closure or seeing the fruits of your labor. The energy is raw and deeply emotional, especially since this full moon is also impacted by both a water and fire trine. It’s a powerful full moon for letting go of whatever no longer serves you. To effectively work with the Full Moon, pull your astrology birth chart and find out where the moon is falling for you. What area of your life is being illuminated? Perhaps it’s taking place in your 4th house and there are changes in your home life. Maybe it’s happening in your 10th house related to job and career. Whatever House the full moon falls in for you, will be where you want to focus. The Sagittarius Full Moon takes place on May 29, 2018 at 10:19 am (7:19am PDT). Sagittarius is a fire sign, spurring bursts of energy, creativity, and insight. It gives you a feeling of fearlessness, and the courage to act quickly. With this potent energy, you may look at yourself, your life, or a particular situation in a new light. Sagittarius helps you gain a new perspective. Sagittarius brings fun and liveliness into your life. It is spontaneous and adventurous. What brings you joy? Sometimes it’s hard to find joy when going through challenges. Finding something that brings you a little sliver of joy to focus upon when facing difficulties helps raise your vibe. Need some ideas? Create a joy list. Make a list of everything that brings you joy – from things that are free such as talking with a friend, or spending time with someone you love to watching movies or reading a book. Also create a joy list that includes items that cost money, like getting energy work, a massage, or pedicure. It’s important to find joy in life to help you see beyond challenges. Tune into the vibration of joy and see how your perspective and energy shifts! Let loose. Have fun! And find joy with the Sagittarius Full Moon! Every full moon is a highly charged and deeply emotional time. Emotions may be easily triggered because this full moon is also influenced by a grand water trine. This means there are planets moving through all of the water signs. Neptune (inspiration & dreams) is passing through Pisces, Venus (love & money) is in Cancer, and Jupiter (luck & expansion) in Scorpio. See which houses these fall in for you. Is there a theme or relationship you see between them? These planetary influences are dredging up past emotional wounds, which may make you feel vulnerable. Observe what and who is triggering your emotions. The full moon is an outward energy, so what needs to be resolved is reflected to you from others. Use journaling, energy work, mindfulness, and essential oils to release the past and clear the slate. Be gentle with yourself as you release the past without feeling victimized. As you release you want to replace by visualizing what you want. As if there isn’t enough going on the this full moon, there is also a grand trine in the fire signs. Fire inspires your creativity and passion. It gets you in touch with your senses and ignites your creative juices. Again… you may be feeling emotions churning on a very DEEP level! Review your birth chart with transits to see how the planets in the fire signs are impacting you. Chiron (the wounded healer) is in Aries helping you uplevel yourself, identify what you like/dislike, and setting better boundaries. The north node (destiny) in Leo helping you follow your passion and take what you “love” to the next level. And finally the moon (emotions) in Sagittarius is helping you release blocks and limitations so you see the bright side of life and take your life to higher ground. Perhaps you book a trip, or decide to take a class. Sagittarius reminds you to be more alert and aware. This can be as simple as having a new perspective and awareness. Watch any judgmental tendencies, dogmatic perspectives, and having expections related to how things “should” be. Let go and go with the flow. Feeling overwhlemed by all of this info? Want help in understanding what it all means for you? Need help in balancing your energy so you feel more grounded, focused, and have more clarity? Schedule an Energy Recalibration appointment. Jana is an intuitive quantum healer. She helps you understand what you are going through, and the best way to navigate it. She will help you release emotional blocks and limiting beliefs so you raise your vibe. She also shifts personal and DNA patterns, changing your life’s trajectory. Book your session now! When the full moon in Sagittarius, the sun is in the opposite sign of Gemini. Gemini stimulates communication and being social. Gemini is idea driven. With the full moon, internal conflicts may arise between Gemini’s side of logic and reason and Sagittarius’ side of living in faith. It’s important to find balance between the two astrology signs. If you are too analytical, and need to know all of the steps in the process, then you may miss important clues that lead you in the right direction. When you live only by faith, you miss the human duality experience of trial and error which ultimately leads to your growth. Find balance between faith and logic to support you. In addition to living more authentically, Sagittarius is forward thinking and focused on the bigger picture. It always has a goal or action in mind. There may be inspiration related to new and better ways of doing things related to your work and personal life. With the Moon in Sagittarius and Neptune in Pisces, there may be a strong desire to seek a deeper level of spiritual knowledge. Sagittarius helps you explore higher realms of spiritual truth. It is teachable and the teacher. It is the explorer. As a forward thinker, it also encourages you to look further down the path, and broaden your perspective. You may be wondering how to begin with the ideas that are flitting around. For a day or two before and after the full moon, use grounding techniques such as mediation, gardening, spending time in nature, yoga, or mindful breathing to help anchor your ideas to feel less overwhelmed on the process. Connect with activities that bring you joy and happiness. Use essential oils such as Frankincense – which supports you in seeing the truth of a situation or your truth. 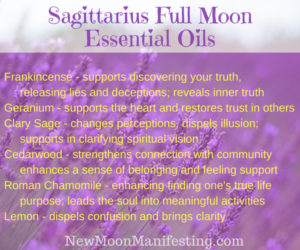 What essential oils are you attracted to with the full moon? Apply them over the third eye, along the spine, and the bottoms of your feet. 1) Make a list of recurring messages or emotions that are coming up. Journal about them and how they make you feel. Identify anyone you need to forgive. Acknowledge the situations you want to release where you have given your power away. Think of words and emotions you want to use to replace what you’re releasing. 2) Use grounding tools such as yoga, breath work, essential oils, meditation, or other activities to help visualize difficult situations or emotions are being released and sent to the heavens or into the earth. 3) Create a ritual where you burn your list from step 1, allowing the smoke to let the energy go. 4) Visualize yourself and your life “as if” what you identified in step 1 has been released and you have reclaimed your power and living authentically. There is an ongoing theme coming to light with the Sagittarius Full Moon – what is true and what is fake. Being aware of this may help you see the truth of a situation so you avoid defending your version of the truth. This may help you in aligning with your higher guidance and standing in your personal power. What are you willing to release with the Sagittarius Full Moon? I’m very interested in a recalibration session. I’ve been through so much over the past few years I feel as is if I don’t know who I am anymore. I’m trying to pull my life back together after losing everything to someone I thought was my friend and ending up homeless.